Mt. Apo, known to be the highest mountain in the Philippine archipelago towering the island of Mindano with 2,956 MASL (based on pinoymountaineer.com) is also considered as the grandfather of the Philippine mountains. The mountain is a potentially-active volcano and there’s no record of its last eruption. I have only known these facts (except for being the highest mountain in the Philippines) since the time I targeted it. Although the desire of climbing mountains has been there, I still could not believe up to this time that I actually went to Mindanao for mountaineering purposes. The desire of a mountaineer’s heart to scale more mountains paved way to reach different destinations. 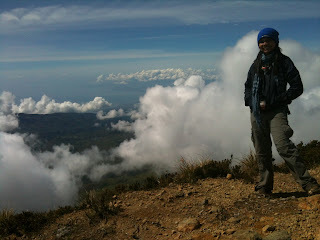 To carry out the first part of our Mindanao Trilogy climb (M123), the first target was Mt. Apo. The original plan was to take a traverse trail, that’s ascending through Kapatagan in Davao and exiting down via Kidapawan trail in North Cotabato. However, a friend of ours named Deejay Leydan who’s hometown is in Kidapawan City (she was one of our climb companions in our Luzon 3-2-1, climb of the 3 highest mountains in Luzon last Oct 2011) became also our contact in Mt. Apo. She and her friends also had a climb on the same dates but just one day ahead of us. She is used to climbing such peak since childhood as his father is DENR’s park ranger of the mountain. She belongs to the Sandawa Mountaineering Club. To continue, the trail that we had finally decided would be taking Kidapawan trail which made us avoid the exit fee if we choose to traverse on the other trail. The advantage, it’s the shortest trail used by mountaineers (aside of course via Energy Development Corporation or EDC, situated within Apo National Park) yet one should expect a very tough steep ascent. The disadvantage, we were not able to experience bouldering in Kapatagan. (At least, we have already a reason to go back to Mt. Apo). We traveled to Kidapawan City in the early morning of August 25 and met up in the terminal with our guide, Sir Don-don of Sandawa Mountaineering Club. From the city proper of Kidapawan to the jump off point is about more than 1 hour-ride with a single motorcycle (This set up if not climbing with a group is very common.) Taking the rough road was such a challenging one. After meeting with the pre-arranged porter, we started the trek at 10:30 am. Even at the beginning of the hike, we already spotted a small area of hot spring, truly indicating the volcanic form of Mt. Apo. Then succeeding river trekking followed. The level of the water that time was tolerable. Some portions of the river crossing were built with a bridge made up of two bamboos for easier crossing. Organizing the climb to Mt. Apo should consider the weather condition as possible flash floods in the river may happen especially during heavy rains. We reached the first campsite after an hour and a half. Afterwards, our next target was the Koong campsite. The trail started to be an assault type. We passed by unknown orange flowers scattered along the trail. That day happened to have a trail run event organized by the province (or city). Thus, we met running participants descending via Kidapawan trail. More steep ascents followed after Koong. Target by then was Lake Venado. Our original plan was to camp in the summit but since we will not traverse through the other trail and for practical reasons, it was decided to have Lake venado to be the target instead after Koong as we can actually stay and set camp there and then push to summit early next morning. At least we can have a good night rest and leave our things in the campsite. Getting steep but we were running out of time so that we won’t be catching ourselves at nightfall along the trail. Thankfully, we arrived at Lake Venado at around 5pm. Deejay and her friends were already set there at the campsite, they said they reached Venado at 1:30pm. It really is! We climbed a 90-degree trail to Venado (thanks to the built wooden ladder!) To my astonishment, It was like I reached a different place or a different country. I was stunned. So this is how I must distinguish Apo from other mountains. After such continuous trek assault and even a 90-degree climb, I was situated in a flat land with a beautiful lake surrounded by trees and towered by Mt. Apo summit. It’s like Mt. Talamitam viewed from such flat land. This very wide land has a very muddy and watery grass. One would likely sink upon stepping into these grasses. According to the guide, the water of the lake occupies most of the area during rainy season and would provide more spaces during summer. The lake is even dangerous. There was a reported “dead on the spot” case when a foreigner climber dived into the water. Two days passed before his body was recovered, according to sir Don. Thus, for safety purposes, we can only take pictures on the side of the lake. Swimming is not allowed and washing is only permissible on the side using a dipper. Otherwise, one might totally sink upon attempt to go beyond. We mingled with other mountaineers for a short while and with Dave Leydan on that night, the brother of Deejay, who was the guide of the group, but we slept early in preparation for the summit assault early next morning. The cold temperature for me, by the way, is manageable. Having the climb package including the food was such a great part and very helpful to us especially to buddy Dennis as we won’t bother cooking for ourselves since the guide took care of our meals for the whole climb. We woke up as early as 2:30am in the morning but we only got to start the trek to summit before 5am. The first part is a short forest which is very muddy and we had to choose what we may stably walk on unless we will submerge on the mud. Upon reaching the grassland, we saw the entirety of the Lake Venado having a very wide campsite surrounded by the trees. Having it surrounded also by clouds (actually sea of clouds), we could imagine that it’s like it’s the only land that exists. It’s a very beautiful view and it became very visible as the dawn breaks. In the middle of the trek is the so-called mini forest that we passed on. At first, I thought it would only be a short trek but I was wrong since one may also spend 2-3 three hours to ascend (depending on the speed). The view has a very good clearing, so taking a short rest along the trail temporarily vanished the tiredness. We reached the campsite summit with the other climbers who stayed last night and preparing to descend. We even met a climb fellow of buddy Dennis, Sir Rey Tejana, who also climbed on that day as well as the guide of the other group, Sir John Murs, our guide in D2K climb. The campsite is surrounded by various peaks. We ascent further to one of its peaks and view the dead lake as well as the boulders. Finally! we arrived at the summit of Mt. Apo. We were so happy climbing it for the first time. On the same day, after going down to Venado camp site, we packed our things up and prepared to descend. The group of Deejay spent one more night because one of their companions got injured. The descent was of course difficult since it’s very steep and just like other high mountains that we scaled, was a challenge to the knee. We arrived at the jump off point at 7pm and preferred to stay at Agco resort, just a few steps from the jump off point. 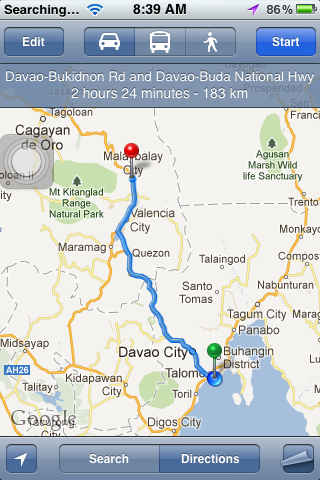 The next morning schedule was to travel back to Davao City. But first, I had a one of my simple yet very adventurous rides of my life--- 4 backpacks and 4 people (including the driver) in a single motorcycle for over an hour rough road ride to Kidapawan City proper. I don’t know how we survived. (laughing at how we looked like) but we had a trust on the driver since they seem used to this kind of set up in taking passengers. Instead of fear, Buddy and I had a joy ride. 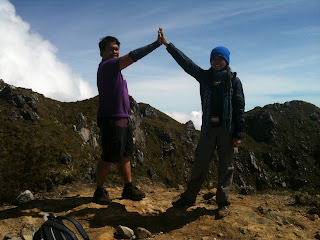 Part 1 of our Mindanao1-2-3 event, Mt. Apo, DONE! They say “be careful with what you wish for.” But hey, it never even crossed to my mind that my feet would reach the top of Mt. Apo, the highest mountain in the Philippines. I was looking for something when I happened to find my scrapbook-like compilation album where I also listed down my dreams when I was 18. There was no dream mountain there. And I didn’t even aspire then to risk myself, wander and explore the mountainous regions in the country. And now, I just got back to Manila from a week stay in Mindanao---- I am a traveler. I am a mountaineer. The story goes like this: My climbing buddy, Dennis Hisanan and I had set it a year ago when were lucky to book a discounted fare in Cebu Pacific. The event was entitled Mindanao 123. It was indeed a long (and difficult , of course) climb as we would be scaling the top 3 highest mountains in Mindanao, from Mt. Apo in Davao to Mt. Dulang-dulang traversing Mt. Kitanglad in Bukidnon. Few of our known mountaineering enthusiasts had already done this and we wanted to try such kind of a climb. Apart from it is the fact that it would be our first time to see and experience the beauty of Mindanao mountains. How does it feel to climb in the southern Philippines and how do they differ from the mountains in Luzon? Another reason for this is that we are Luzon-based climbers and it is better and practical to maximize the time we spend there as the proximity of the provinces where they are located are manageable in terms of travel (bus travel only). Arriving in Davao City on the night of 24th day of August, it ended with also a night flight to Manila from Cagayan de Oro on the 2nd day of September (2012). Our climb proper in Mt. Apo was held overnight from August 25-26 taking Kidapawan trail back and forth (discussed in detail in a separate post). Hence, we traveled to Kidapawan City in the early morning of the 25th. Our spare day was Monday, August 28 when we also traveled back to Davao City after the Apo climb. We were able able to just waste the day in rest, food trip and relaxation in Davao. The next day was the travel time to Bukidnon which was also the day of meet up with our guide in Dulang-dulang-Kitanglad(D2K) climb and another fellow mountaineer , Jenny Tanedo who joined us . However, delayed in the schedule and itinerary unexpectedly happened until the original schedule of start trek to D2k on the 29th (discussed further in a separate post). Spending the week in Mindanao was actually made me get myself to places in four provinces—North Cotabato, Davao del Sur, Bukidnon and Cagayan de Oro. Bad thing was due to the mentioned delays, we were not able to do a side trip like the planned longest zip line experience in Bukidnon or Camiguin Island which is a few-hour travel from Cagayan de Oro. 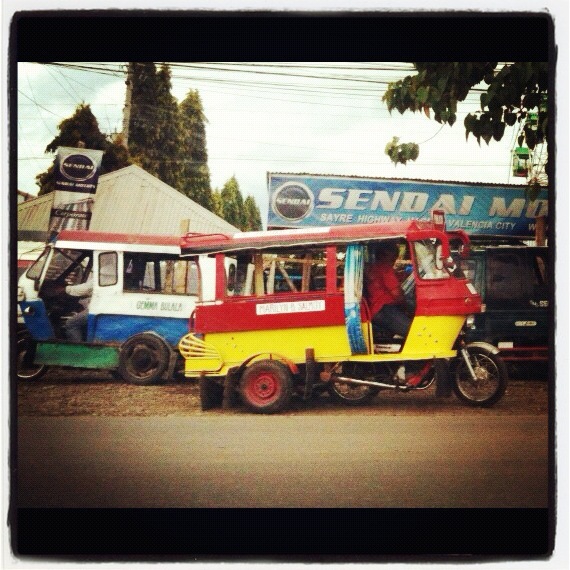 Three things that amused me were: first, the multi-cab, we do not have that in Luzon. The capacity of multi-cab, as the name implies, is more than that of the typical tricycle. Second, the Bisaya dialect. I am a pure Tagalog and the only statement I know is “Maayong Buntag” (Magandang umaga/Good Morning) and I was able to remember one word “subida” (akyat). I was like a “zipped mouth” when mingling with the local people there. All I had to do was to hear but not understand them (I was like an idiot… laughing). Well, give me a chance to stay there for some time and I would learn the dialect (more laughs). Lastly, I love the farm in Bukidnon. It’s like a very narrow and continuous fruit and vegetable plantations on each side of the road that we viewed after reaching the exit point of Mt. Kitanglad and heading to Sitio Intavas in the town of Impasug-ong. I am very grateful for this opportunity and good break from work. I was able to take such kind of long vacation because of the 2-week mandatory leave in the office. After spending first few days in my hometown with my family, Mindanao-bound trip followed and it was such an unforgettable trip of my lifetime. I saw a post which says “life is better outside your bubble”. Indeed, there’s more to life that God has given when you tried to explore. As for me, I’ve gained some realizations and new learnings in life every time I travel and I’ve learned to be thankful of the things I see and experience.